Thus, Varna Municipality has received the right to manage for a period of ten years the Varna Chalcolithic Necropolis; the Large Roman Thermae; the Small Roman Thermae; the Bishop’s Basilica of the Ancient Thracian, Greek, and Roman city of Odessos (Odessus); the Knyazheski (Royal) Monastery; and the Aladzha Monastery. Of the six archaeological sites in question, the Varna Chalcolithic Necropolis is world famous as the site of the world’s oldest gold. The Large Roman Thermae of the ancient city of Odessos (Odessus) were built in the 2nd century AD, and the Small Roman Thermae – in the 5th century AD. The Bishop’s Basilica of Odessos (Odessus) is part of an Early Christian complex of three basilicas dating back to the 4th-6th century AD, i.e. the Late Roman and Early Byzantine period. The Knyazheski (Royal) Monastery located in an area known as Karaach Teke dates back to the 9th-10th century AD, the height of the First Bulgarian Empire. Aladzha Monastery (which comes with a property of 291 decares (app. 72 acres) is a rock monastery outside of Varna, which dates back to the 13th-14th century AD. “[Our] aim is to preserve the excavated archaeological properties, to accelerate the projects for their exhibition and promotion, and to organize open-air events [there],” says the announced of the press service of the Bulgarian Cabinet with respect to the decision to grant management rights of the six sites to Varna Municipality. Learn more about the Varna Chalcolithic Necropolis and its gold treasure, and the ancient city of Odessos (Odessu) with its Roman Thermae in the Background Infonotes below! In similar moves designed to provide the local authorities with opportunities to boost cultural tourism, in July 2015, the Bulgarian government granted the northern Veliko Tarnovo Municipality 10-year management rights of the Trapesitsa Hill Fortress, and in earlier in October 2015, it granted the southern Plovdiv Municipality management rights for the Early Byzantine Great Basilica. Bulgaria’s Varna Gold Treasure is considered the oldest processed gold in the world dating back to the time of the Chalcolithic (Aeneolithic, Copper Age) Varna Culture (usually dated to 4400-4100 BC). It was discovered in 1972 in the so called Varna Chalcolithic Necropolis during the construction of a canning factory. It was the operator of an excavator, Raycho Marinov, then aged 22, who stumbled upon several artifacts, collected them in a shoe box, and took them to his home. A couple of days later he informed the local archaeologists. For his discovery back then, Marinov was awarded BGN 500, a substantial sum for the time equaling several monthly salaries. However, the intelligence services of the Bulgarian communist regime followed him around for a while to make sure he had not kept any artifacts for himself in order to sell them. A total of 294 Chalcolithic graves were unearthed at the necropolis which was excavated by Bulgarian archaeologists Mihail Lazarov (in 1972–1976) and Ivan Ivanov (in 1972–1991). About 30% of the estimated territory of the necropolis is yet to be excavated. Using radiocarbon dating, in 2006, the Chalcolithic graves where the Varna Gold Treasure was found were dated to 4560-4450 BC. The discoveries from the necropolis indicate that the Varna Culture had trade relations with distant Black Sea and Mediterranean regions. It likely exported rock salt from the Provadiya – Solnitsata (“The Salt Pit”) rock salt mine. The shells of the Mediterranean mollusk Spondylus found in the graves in the Varna Necropolis and at other Chalcolithic sites in Northern Bulgaria may have been used as a form of currency. Among the graves, several featured a wealth of gold artifacts indicating that as early as the Chalcolithic the Balkan Peninsula (Southeast Europe) already had some form of statehood and a royal institution. The gold artifacts from the Varna Chalcolithic Necropolis were found in graves with skeletons (mostly male) as well as in symbolic graves without human remains. One of the most interesting inventories was found in the so called Grave No. 43 which was unearthed in the central part of the Varna Necropolis in 1974. It belonged to a male aged 40-45 but of rather substantial size for the time, 1.70-1.75 meters tall (app. 5 feet 6 – 8 inches). The numerous gold artifacts discovered in Grave No. 43 near Bulgaria’s Varna weighbb a total of 1.5 kg which one of the reasons to believe that the buried man was a very important member of his community. The gold items include 10 large applications, a high number of rings some which were on strings, two necklaces, an item believed to be a gold phallus, beads, golden decorations for a bow, a stone ax and a copper ax with gold decorations, a bow with gold applications. The funeral inventory also includes a large number copper artifacts such as a copper ax, a copper claw hammer, a copper chisel and a copper awl as well as lots of stone, flint, seashell, and bone artifacts including bracelets from the Spondylus mollusk, and 11 ornately decorated ceramic vessels. In another grave of the Varna Chalcolithic Necropolis, Grave No. 36, a symbolic grave, the archaeologists found over 850 gold items – a tiara, earrings, a necklace, a breastplate, bracelets, a belt, a gold hammer-scepter, a good model of a sickle, two gold lamellas representing animals, 30 models of heads of horned animals. The artifacts were found covered with a gold-laced cloth. The gold items lined the contours of a human body with more artifacts on the right side which is deemed to signify that the grave contained a male funeral. The gold artifacts are interpreted as royal insignia. Similar “royal” burials have also been found in graves No. 1, 4, and 5 of the Varna Chalcolithic Necropolis. Another type of graves in the necropolis contains clay masks of human faces where the eyes, mouths, teeth, and noses are depicted with gold. Unlike the graves described above which contain smith tools, the graves with the mask contain clay vases, cups, and needles. That is why these are interpreted as female funerals depicting the Mother Goddess. The closeness of the “female” symbolic graves No. 2, 3, and 15 with the symbolic royal graves No. 1, 4, and 5 are interpreted as ritual representations of holy marriages between a king and the Mother Goddess. These six funerals are believed to have been the core of the Chalcolithic Necropolis in Bulgaria’s Varna, and to have predated the rest of the graves. Much of the meaning of the finds from the necropolis is seen as celebrating the role of the smith who in his role as a creator is seen as supplanting the role of the Mother Goddess transforming the matriarchal world into a patriarchal one. The position of the smith in the Chalcolithic culture is seen as comparable to that of the king because during the Chalcolithic period metal was more of a status symbol than an economic means. Ancient Odessos (known as Odessus in Roman times) is considered the precursor of the Bulgarian Black Sea city of Varna. It was founded by Miletian Greek colonists at the end of 7th century BC, the earliest Greek archaeological material dating back to 600-575 BC. However, the Greek colony was established within an earlier Ancient Thracian settlement, and the name Odessos had existed before the arrival of the Miletian Greeks and might have been of Carian origin. Odessos as the Roman city of Odessus became part of the Roman Empire in 15 AD when it was incorporated in the Roman province Moesia. Roman Odessos is especially known today for its well preserved public baths, or thermae, the largest Roman single structure remains in Bulgaria, and the fourth largest Roman public baths known in Europe. The First Bulgarian Empire (680-1018 AD) conquered Odessos (Varna) from Rome‘s successor, the Eastern Roman Empire, or Byzantium, in the late 7th century. It is even believed that the peace treaty in which the Byzantine Empire recognized the ceding of its northern territories along the Danube to Bulgaria was signed in Odessos. The wall (rampart) that the first ruler of Danube Bulgaria, Khan (or kanas) Asparuh built at the time as a defense against future Byzantine incursions is still standing. Numerous Ancient Bulgar settlements around Varna have been excavated, and the First Bulgarian Empire had its first two capitals Pliska (681-893 AD) and Veliki (Great) Preslav (893-970 AD) just 70-80 km to the west of Varna. It is suggested that the name of Varna itself is of Bulgar origin. In the Middle Ages, as a coastal city, Varna changed hands between Bulgaria and Byzantium several times. It was reconquered for the Second Bulgarian Empire (1185-1396 AD) by Tsar Kaloyan (r. 1197-1207 AD) in 1201 AD. The Large (North) Ancient Roman Thermae in Bulgaria’s Black Sea city of Varna are the ruins of the first and larger public baths that functioned in the Ancient Roman city of Odessus (known as Odessos in Thracian and Greek times). They are located in the southeastern part of today’s Varna. With a total of area of 7000 square meters, and a height of 20-22 meters, the thermae in Varna are the largest public building from the Antiquity period unearthed in Bulgaria. The Roman Thermae in Bulgaria’s Varna are ranked as the fourth largest preserved Roman thermae in Europe after the Baths of Caracalla and Baths of Diocletian in the imperial capital Rome and the baths of Trier, and the largest in the Balkans. They were built in the 2nd century AD, after the previously Ancient Thracian town and then Greek colony of Odessos was made part of the Roman province of Moesia in 15 AD, and were in use for about 100 years. Coins of Roman Emperor Septimius Severus (r. 193–211) have been found among their ruins. The Thermae featured facilities such as an apodyterium (changing room), a frigidarium (cold pool), a tepidarium (warm pool), and a caldarium (hot pool) as well as a palaestra (a space with social and athletic functions). They were heated with a hypocaust, an underfloor heating system of pipes. The Roman Thermae in Varna were first seen an archaeological site by Austro-Hungarian researcher E. Kalinka in 1906, and were later excavated by Czech-Bulgarian brothers Karel and Hermann Skorpil, who are known as the founders of Bulgarian archaeology. They were also excavated in 1959-1971 by a team led by Bulgarian archaeologist M. Mirchev. In 2013, Varna Municipality allocated BGN 150,000 (app. EUR 75,000) for the rehabilitation of the Large Roman Thermae. 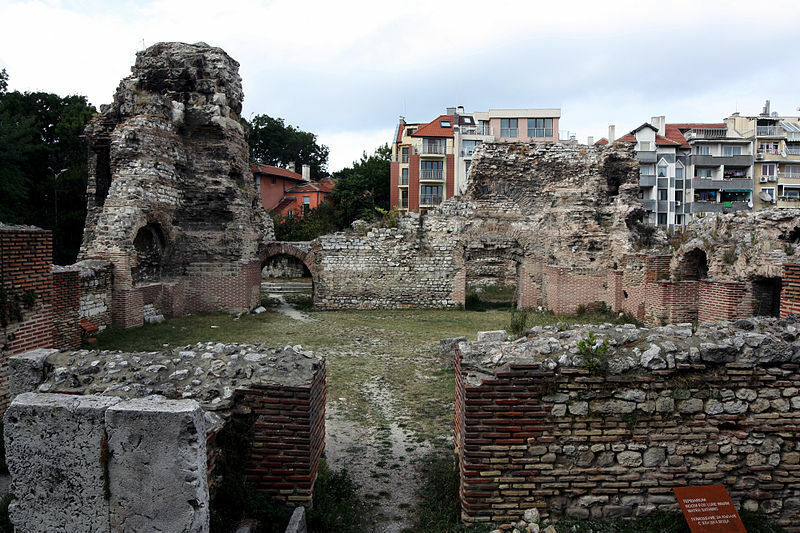 The Small (South) Ancient Roman Thermae in Bulgaria’s Black Sea city of Varna are the ruins of the later and smaller public baths that functioned in the Ancient Roman city of Odessus (known as Odessos in Thracian and Greek times). They are located in the southeastern part of today’s Varna but further south than the Large Roman Thermae. They were built in the 5th-6th century AD as the city of Odessus experienced a decline (at the time the entire Roman Empire was in decline), after the Large Thermae were abandoned and partly destroyed in the 3rd-4th century AD. The Small Roman Thermae were erected on top of an Ancient Thracian temple or sanctuary that honored Ancient Greek god Apollo as well as a female deity that the Varna achaeologists at first believed was Ancient Thracian goddess Bendis but have recently changed their interpretation to believe that it was in fact Ancient Greek goddess Aphrodite that the Thracian had worshipped. In 2013, Varna Municipality allocated BGN 130,000 (app. EUR 65,000) for the rehabilitation of the Small Roman Thermae.